Still in Chicago, Jurgis is once again destitute, and finding work amidst the economic crisis proves nearly impossible, and he has now been abandoned by Scully because of his attack on Connor. Moreover, his involvement with graft makes him a target, and the more comfortable lifestyle he had enjoyed makes poverty all the worse. Jurgis becomes so weak and hungry that, when he finally finds a job, he is abruptly fired because he is not strong enough to do the work required of him. While the underworld may have treated Jurgis well for some time, he is at this point much worse off for having involved himself with corruption. He is robbed even of his physical vigor, which signals that he has reached a new low of hopelessness. One day, Jurgis attends a political rally to find shelter. Seeing the politicians sparks Jurgis's resentment, as he is no longer able to enjoy the benefits of graft. He tries to stay awake, but begins to snore, and is kicked out by a policeman. Jurgis attends the political rally not because he believes in politics—how can he believe in politics when he has spent so much time as a part of the machine that successfully corrupts it—but just as a place to get a nap. Politics, like religion in Chapter 23, is revealed as another process or institution that does not benefit the poor. Jurgis must again beg for shelter. He approaches a well-dressed woman, and she turns out to be an old acquaintance from Jurgis's early time as an immigrant. She has done well for herself, but has no money on her—instead, she tells Jurgis where he can find Marija. Jurgis's current situation becomes all the more pathetic and disappointing when it is juxtaposed with the relative success one of his fellow immigrants has found. As soon as Jurgis reaches Marija's building, it is raided by police. After seeing scantily-clad women and embarrassed men clamor past him, Jurgis understands that the building is a brothel. He finds Marija, and the two catch up. She tells him that she has been forced by necessity to work as a prostitute in order to feed Elzbieta and the children, and that Stanislovas died after falling asleep in an oil factory and being eaten alive by rats. Jurgis brings up his abandonment of the family, and Marija excuses him for running away. Marija opines that in hard times, people should sell anything they can, and suggests that Jurgis overreacted to Phil Connor's abuse of Ona—it would not have been an indignity if Ona supported the family as a prostitute, Marija adds. Marija's story shows that the family's fortunes have only worsened in Jurgis's absence. Horrible circumstances have hardened Marija and worn down her dignity. Her own body is no longer sacred to her, as she now cynically believes the capitalist ethos that everything that can command a price should be sold—including herself, including Ona. She now sees survival as the only thing worth anything—not morals, principles, or anything else. And she sees money as the only way to ensure survival. Jurgis is rounded up with the rest of the brothel's patrons and taken to jail, where he gives a false name. In his cell, he grieves at the family's wretchedness, and once again feels the kind of sadness he had worked hard to suppress. Though his involvement with graft has dulled his conscience, Jurgis's morals finally catch up with him when he is confronted with the destruction capitalism has wrought on his family. Sobel, Ben. "The Jungle Chapter 27." LitCharts. LitCharts LLC, 5 Jan 2014. Web. 22 Apr 2019. Sobel, Ben. "The Jungle Chapter 27." LitCharts LLC, January 5, 2014. 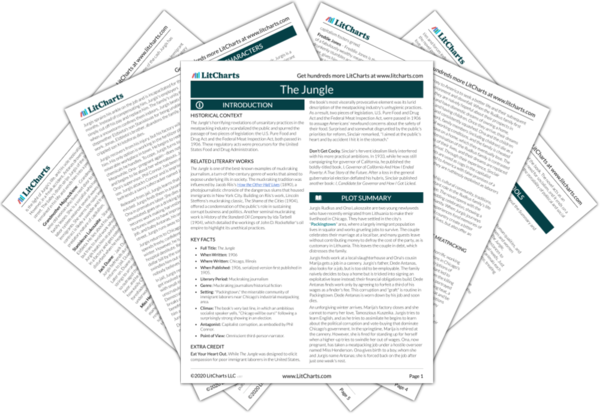 Retrieved April 22, 2019. https://www.litcharts.com/lit/the-jungle/chapter-27.